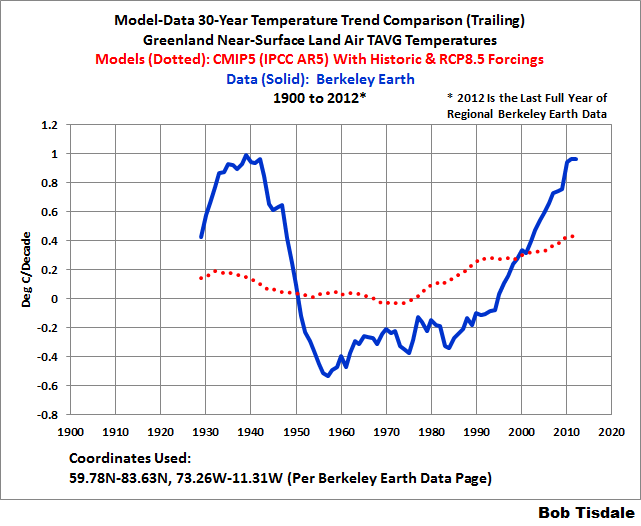 Willis Eschenbach’s post Greenland Is Way Cool at WattsUpWithThat prompted me to take a look at the Berkeley Earth edition of the Greenland TAVG temperature data. 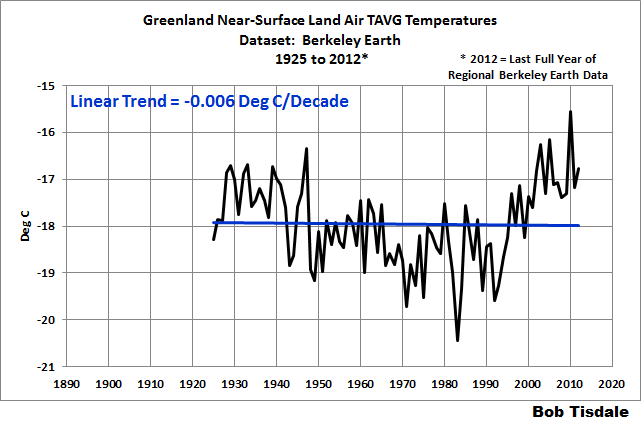 See Figure 1, which presents the graph of the annual Berkeley Earth TAVG temperature (not anomaly) data for Greenland from 1900 to 2012, which is the last full year of the regional Berkeley Earth data. With the relative large multidecadal variations in the data, it seemed as though I was taking the trend of one and a half cycles of a sine wave. That prompted me to start the graph in January 1925 and check the linear trend again. See Figure 2. 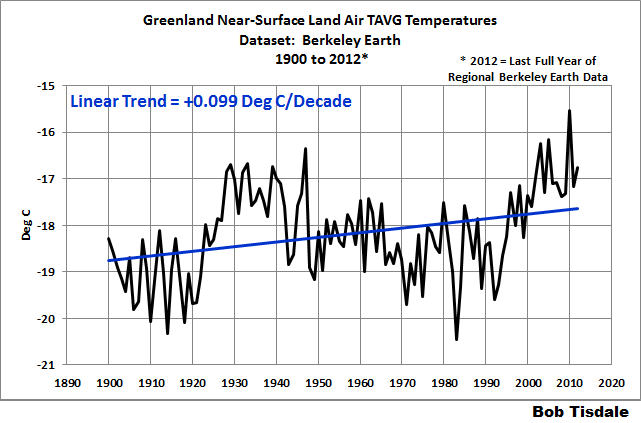 Imagine that: a flat linear trend of Greenland land surface TAVG temperatures from 1925 to 2012. Are you wondering if the climate models stored in the CMIP5 archived (which was used by the IPCC for their 5th Assessment Report) showed a similar not-warming trend for the same time period? Wonder no longer. See Figure 3. The climate model outputs, the CMIP5 multi-model mean, are available from the KNMI Climate Explorer. For Greenland, I used the coordinates of 59.78N-83.63N, 73.26W-11.31W, which are listed on the Berkeley Earth data page for Greenland, under the heading of “The current region is characterized by…”. The simulations presented use historic forcings through 2005 and RCP8.5 forcings thereafter. I use the model mean, because it represents the consensus (better said, group-think) of the climate modeling groups who provided climate model outputs to the CMIP5 archive, for use by the IPCC for their 5th Assessment Report. For those who would prefer to see the full spread of the model outputs in a model-data comparison, you may want to think again. See Figure 4. 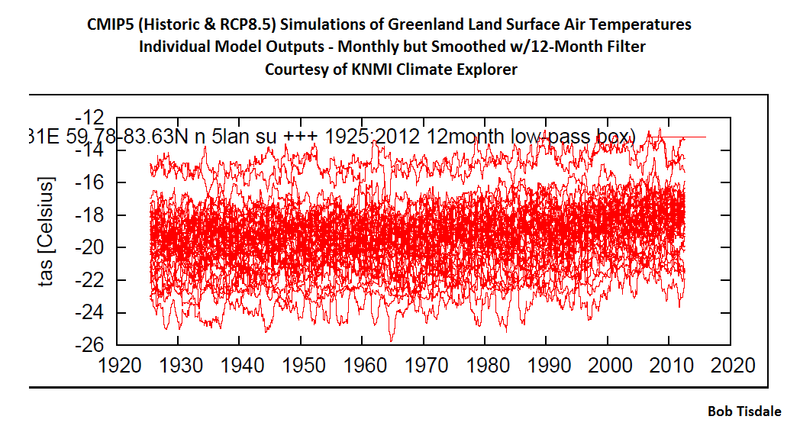 It’s a graph created by the KNMI Climate Explorer of the 81 ensemble members of the climate models submitted to the CMIP5 archive, with historic and RCP8.5 forcings, for Greenland land surface temperatures, based on the coordinates listed above. There appears to be roughly an 8-deg C spread from coolest to warmest model. Well, that narrows it down. 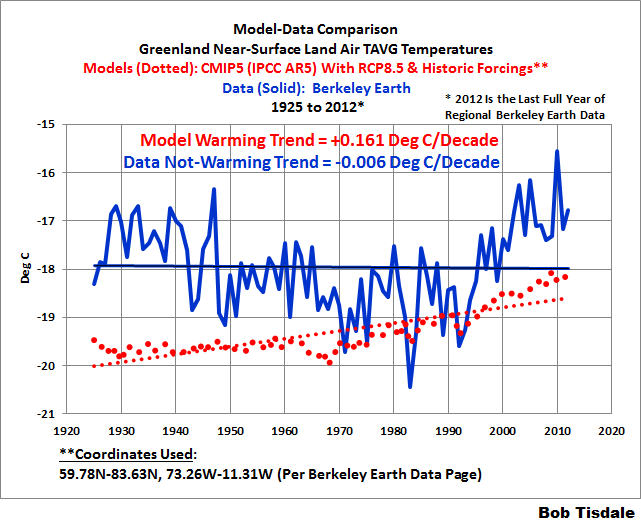 It’s just another example of how the climate models used by the IPCC for their long-term prognostications of global warming are not simulating Earth’s Climate. Each time I plot a model-data comparison, I find it remarkable (and not in a good way) that anyone would find climate model simulations of Earth’s climate, and their simulations of future climate based on bogus crystal-ball-like prognostications of future forcings, to be credible. Back to the multi-model mean: Figure 5 presents the observed and climate-model-simulated multidecadal (30-year) trends in Greenland near-surface land air temperatures, from 1900 to 2012. Once again, the models are clearly not simulating Earth’s climate. I’ll let you comment about that. We’ve already discussed and illustrated back in 2012 how climate models do not (cannot) properly simulate polar amplification. See the post Polar Amplification: Observations Versus IPCC Climate Models. The WattsUpWithThat cross post is here. That’s it for this post. Enjoy the rest of your day and have fun in the comments. This entry was posted in Model-Data Comparison LSAT. Bookmark the permalink. God, I love ya, Bob. An 8 deg C spread means the different models are using different physics. I’ll also see what comments show up on WUWT. Bob ,how does this compare to Vinther’s 2006 long instrumental record of Greenland? This is a very long study over 200 years and co-authors are prominent alarmist UK scientists Dr Jones and Dr Briffa. Looking at temps over this long period we find that much earlier decades are warmer than the last few decades and they even hold up well against some of the decades over one hundred years ago, back in the 1800s. See TABLE 8. So what will be their excuse when the AMO changes to the cool phase, perhaps sometime in the 2020s? Or has it started already? Who knows? https://crudata.uea.ac.uk/cru/data/greenland/vintheretal2006.pdf See TABLE 8 from the study comparing decades. I left a comment under your “Greenland” article at WattsUpWithThat, but I wasn’t sure whether you would see it. I consider myself to be a skeptic. I have a good science education, and love science, mathematics, and computer programming (I work as a programmer). I have excellent Excel skills, and use Excel for most of my global warming research. I even invented a new type of graph, which I call a “Global Warming Contour Map”, which shows how warming rates vary for every possible date range, and every possible date range length. It is useful for spotting slowdowns. I have my own small website (agree-to-disagree.com), with quite a few articles. I research any topic that I consider interesting. Like you, I like real, actual, absolute temperatures. I have created another new type of graph that I call the “Temperature Range Comb” (but I also call it the “Comb of Death”, to annoy Alarmists). It shows the real, actual, absolute temperature ranges, for over 24,000 real locations on the Earth. The “Temperature Range Comb” includes 23 locations in Greenland. Let me know if you would like the Greenland temperature data. Because the “Temperature Range Comb” covers over 24,000 locations, it is obviously hard to see individual locations. But I could recreate the graph with less locations. I like finding out things about global warming, and enjoy a friendly debate. Unfortunately, Alarmists don’t believe in friendly debate. If you want to read any of my articles, I need to warn you that I have a very “lame” sense of humour. I love absurd humour, like Monty Python. I am not as good as them, but I keep trying. I will repeat my comment from WattsUpWithThat, below here. ❶①❶① . . . The “Temperature Range Comb” . . .
you might be interested to see how Greenland’s temperature ranges, compare to other places in the world. The “Temperature Range Comb” (a type of graph which looks like a “comb”), displays temperature ranges, for more than 24,000 real locations on the Earth. And I am talking about REAL, ACTUAL, ABSOLUTE temperatures. Not those weak, pale, temperature anomaly things. The temperature range for each location, goes from the temperature of the month with the highest average high temperature, to the temperature of the month with the lowest average low temperature. To make it easier to refer to the temperature ranges, I will call the month with the highest average high temperature, the hottest month. And I will call the month with the lowest average low temperature, the coldest month. The temperature ranges are sorted by the hottest temperature, followed by the coldest temperature. Each hottest temperature, has a range of coldest temperatures. Because of this, the sorting causes the graph to have the appearance of a “comb”. I have given each location a sequence number, based on its position in the sorted list of hottest temperatures. So it goes from 1, for the location with the highest “hottest” temperature, to just over 24,500 for the location with the lowest “hottest” temperature. There are 23 Greenland locations, with sequence numbers between 24,524 and 24,604. A word of warning. The X-axis is “reversed”, so zero is on the right side of the graph, and high numbers like 24,500 are on the left side of the graph. So all of Greenland’s locations are near the left edge of the graph. I hope that makes sense. Having to explain hottest, highest, high, average, low, lowest, and coldest, in various combinations, is difficult. I am happy to answer any questions, if you have any. Have you considered updating Gulf of Maine temperatures you first discussed back in 2014. Pershing’s “10X faster” claim is still out there and is approaching meme status. Would you be willing to discuss this on-camera for a documentary? Sad to say, Bruce: I haven’t. ❶①❶① . . . The recent Slowdown – on trial . . .
Sheldon is prepared to go to extreme lengths to help his friend. He has taught himself to text message with his toes, using a cellphone that is hidden in his shoe. Sheldon will be sending us text message “reports” from inside the room where the jury members are deliberating. These text message reports will be limited to 160 characters per text message (Sheldon refuses to use Twitter), so Sheldon will use abbreviations where necessary.